Steam is a great service, but it isn't the only game in town. 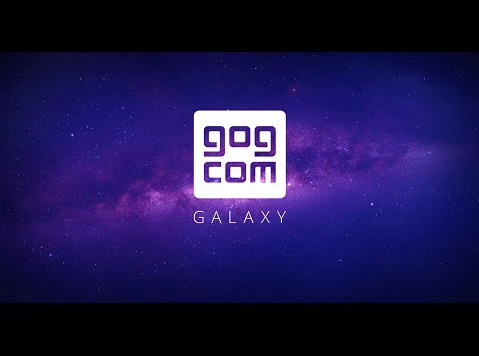 The successful website GOG - formerly Good Old Games - has created their own DRM-Free Steam Alternative, named GOG Galaxy. The service is currently in Open Beta for Windows and Mac OS, and soon for Linux users. Do you think GOG will succeed as a Steam alternative? 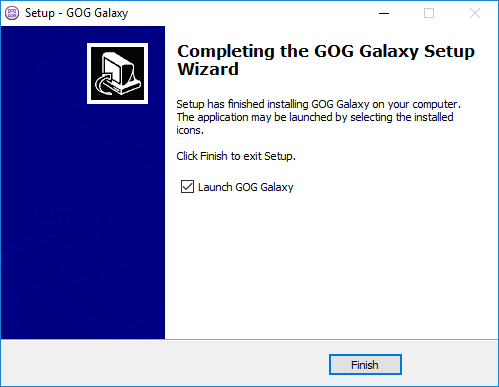 To give GOG Galaxy a try, we just need to visit http://www.gog.com/galaxy and download the latest version. The site is available in English, French, German, and Russian, and it supports prices in both US Dollars and Euros. The installation is straightforward and won't attempt to install any unwanted third-party apps. The first time we start the app, it will ask us to log in. We can create a new account with "I'M NEW HERE". We only need to provide a Username, Email, and Password. 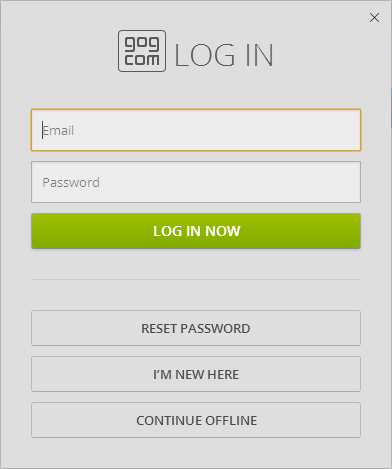 GOG Galaxy has a simple interface. On the first page, we see the new announcements and staff picks. Scrolling down, we will find a Steam-esque list of games, in different views: Popular, New, Upcoming, and On Sale. 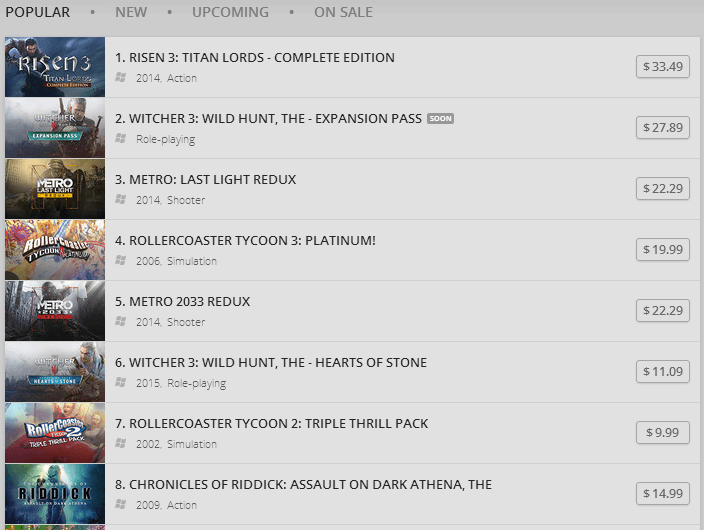 From the Store -> Browse Games menu, we can arrange the 1400+ games GOG offers currently by how much they have sold, and here we will find the true classics. 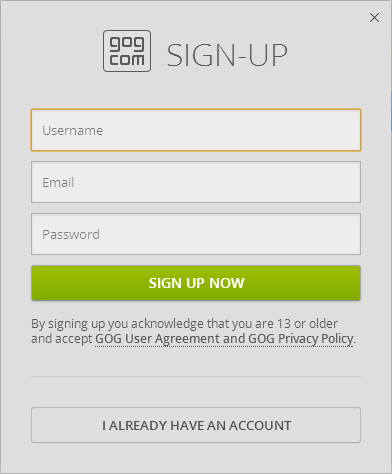 One great advantage of GOG Galaxy is that the games are DRM-Free. We won't have to put up with the annoyance of not being able to play a single player game because the company's servers are down, or our Internet might be acting up. 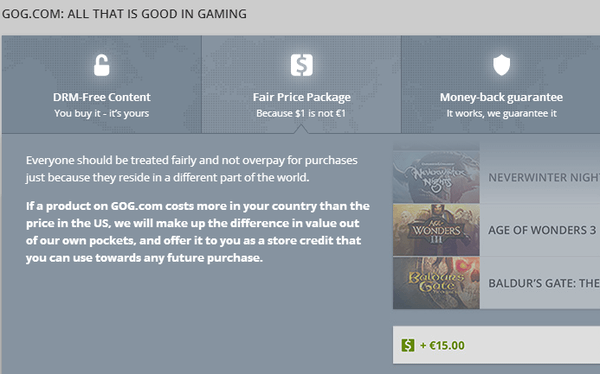 Also, as opposed to many, many online shops, GOG won't equate dollar and euro prices, which is good news for European citizens. 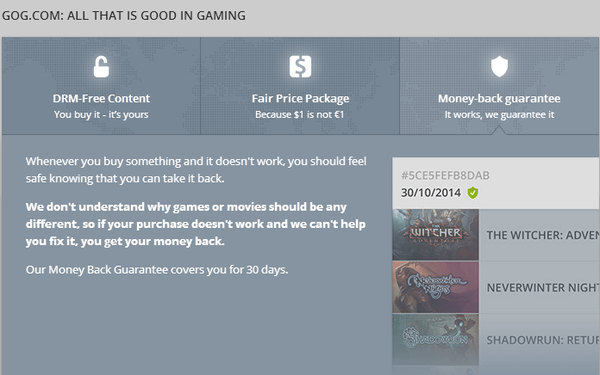 Finally, if we buy an old game and doesn't work, GOG has a 30-day money back guarantee. We should mention that this isn't an "I didn't like that game" guarantee, like Steam has. 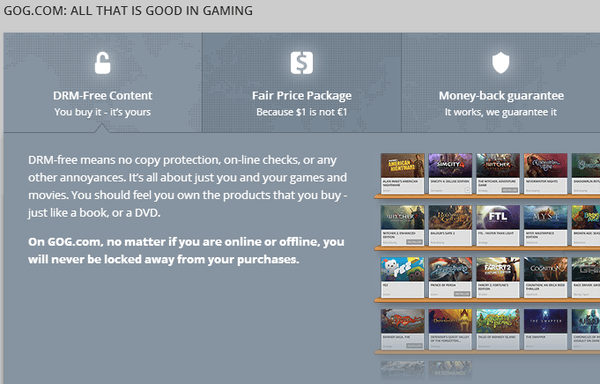 It only covers the case that a game doesn't work, and GOG's technicians couldn't get it to work either on our system. You will find the details here. 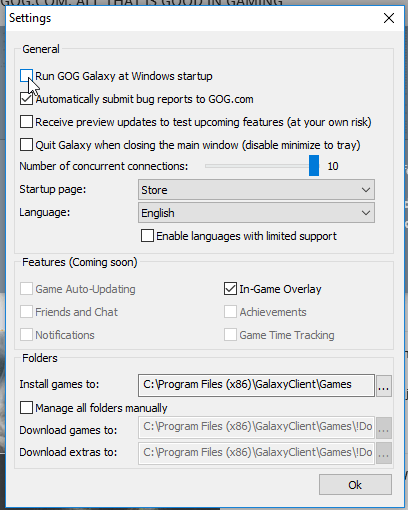 Finally, before leaving GOG Galaxy, remember to click ton the little cog icon on the bottom, and uncheck the "Run GOG Galaxy at Windows startup" option. We probably have enough apps starting with Windows and taking up resourses. 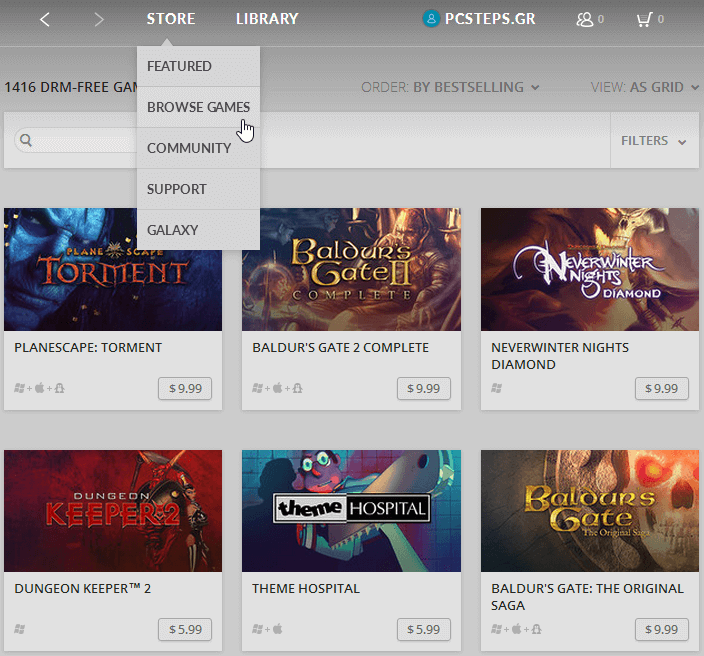 GOG Galaxy is less than a year old, and its library of games is much different than Steam's, or Origin's for that matter. We will find many old titles that we won't find anywhere else, but blockbuster titles such as GTA V which require DRM will probably never find their way to GOG Galaxy. 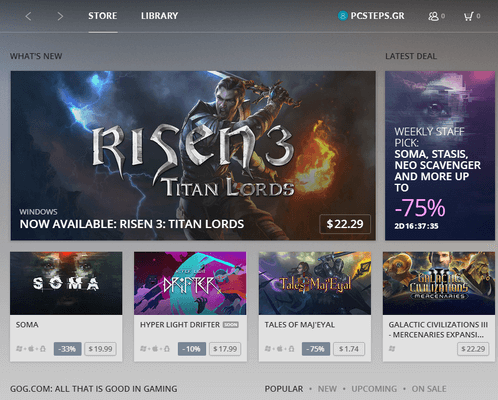 Do you think GOG Galaxy will succeed as an old-school Steam alternative? Or you believe it's doomed in the long run? Leave us a comment. Previous Post: « What is a Virtual Machine and Why Would I Need One?